I had a small paper cut on my wrist (a.k.a boo boo). While for many people that might not seem like such a big deal, for a toddler it is a rare opportunity to employ one of the greatest inventions of mankind: the band aid. Upon conclusive evidence that the kiss has in fact improved the situation, the toddler makes a move for the medical cabinet. Forget about pills, antiseptics, sterile gauzes or wipes. For a toddler, the only thing a boo boo needs is a band aid. As Maayan was handling her patient (me), as soon as the band aid was on, everything was healed. That was it. Maayan didn’t ask about my cut again. Once the band aid goes on, there is no more need for concern. The band aid takes care of all pain. When it comes to boo boos, toddlers say to just put on a band aid. Do what you can do with a lot of love and then don’t worry about it. Sometimes, all we need is for someone to ask what’s hurting us, give us a kiss and put on the band aid of no need to worry. Everything will be fine. Life lesson of a toddler #24: If you see someone in pain, ask them where it hurts. Then give them a band aid. 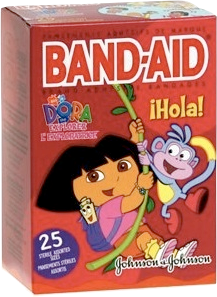 Even if their pain isn’t physical, giving someone a band aid always helps.